A Utah woman is in critical condition Thursday after she sipped a mixture of sweet tea and lye at a barbecue restaurant, police said. 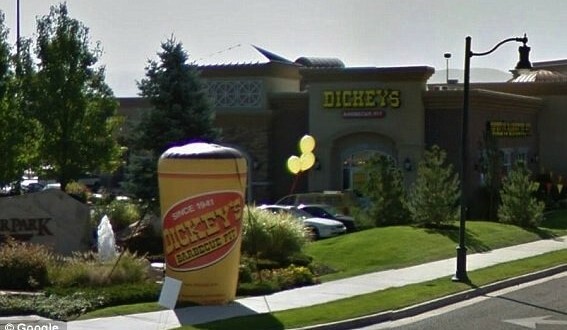 The woman, 67, was eating on Sunday afternoon at Dickey’s Barbecue Pit in South Jordan, about 15 miles south of Salt Lake City, when she poured a glass of sweet tea from the self-service beverage bar, said South Jordan Police Cpl. Sam Winkler. “She takes a sip, and her mouth instantly starts burning,” Winkler said. She tried to spit out the tea, but her mouth and throat suffered severe burns, Winkler said. Her husband took her to a nearby hospital, and she was flown to University Hospital’s burn unit, where she remained in “extremely critical condition” on Wednesday night, Winkler said. “We’re not sure how, but a highly toxic industrial cleaning chemical somehow made its way into the tea,” Winkler said. The chemical is 67 percent sodium hydroxide, commonly known as lye, Winkler said. It is used to clean grease off the restaurant fryers and appears to have been mixed with the tea accidentally. The restaurant was cooperating with the investigation, Winkler said.